Labour’s campaign manager has insisted his party is still fighting to win the Holyrood election, even though polls put it in a “difficult” place. He said: “We’re working for every vote, we’re campaigning to win this election. 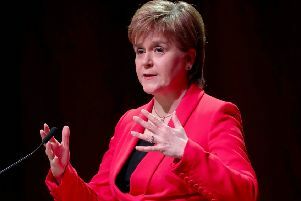 A new opinion poll has put the SNP on course for another majority at Holyrood, with Labour neck-and-neck with the Conservatives in the race for second place. But Mr Rowley said: “In this election, more than any other election over a lot of years that I can remember, there is a real difference, a real choice between the parties, the parties of austerity, the SNP and the Tories, or the party that is against austerity, Labour. “We know that the polls are difficult for us, we know that the last two years have been difficult for Labour, but I believe we’re in the right place. Campaigning at a bowling club in Coatbridge, North Lanarkshire, he highlighted Labour’s pledge to ensure that anyone who needs a home care package will have the support they need in place within a week. He said: “Right now in Scotland one of the biggest challenges in our National Health Service is bed blocking, and while people talk about the pressures that puts on hospitals we’ve always got to remember that we’re talking about real people, trapped in the hospital when they should be in the community.